The Convention on the Rights of Persons with Disabilities (CRPD) has generated new ideas and standards in healthcare and disability law and policy. In the mental health context, the CRPD directs governments to ensure people with mental impairments are treated equally before the law, including ensuring people have access to the resources necessary to enjoy their rights. But what this means in practice remains unclear. In addition, current domestic laws that authorise involuntary psychiatric interventions stand at cross-purposes with the CRPD, which requires respect for the 'will, preference and rights' of persons with disabilities 'on an equal basis with others'. This book explores the implications of the CRPD for law, policy and practice that responds to the complex issues raised by mental health impairment and disability. 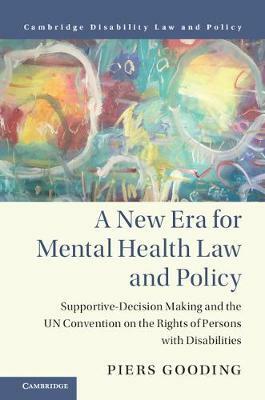 It argues that the support framework of the CRPD holds potential to address persistent shortcomings in mental health law and policy. Piers Gooding is currently Postdoctoral Research Fellow at the Melbourne Social Equity Institute and the Melbourne Law School at the University of Melbourne. He has held a number of teaching and research appointments, including at Monash University, the Centre for Disability Law and Policy at the National University of Ireland, Galway, and as a visiting research fellow at King's College London. His research focuses on disability law and policy, with a special focus on the UN Convention on the Rights of Persons with Disabilities.